About Ioannis Solomozis : Ioannis Solomozis is a designer and entrepreneur, based in Athens, Greece. His work has been featured in Pantone's catalog of trends for 2018. Awarded with German Design Award and A Design Award for his “Jungle” Pattern. 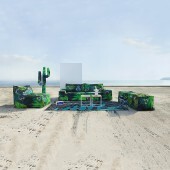 Collaborated with Paola Navone on Erosantorini project. From 2015 is showcasing his work on international exhibitions in Athens, London and Paris. His latest collaboration is with Christou company which he designed medical supply products. I believe design is about re-imagining products and trends on a personal level. I bridge the gap between the artistic elements of design and the practical reality of fabrication. This means i make everything from scratch, taking part in every step of the creative process to the end result. 2005-2014, Art Director, Arch Shop, ATHENS/GREECE. 2014-Present, Creative Director, Solo Athens, ATHENS/GREECE. 2015, "Maison et objet", Parc des Expositions Nord Villepinte, PARIS/FRANCE. 2015, "Hotel Expo", Tae kwon do Athens, ATHENS/GREECE. 2015, "100% SOLO Hotel Show", MEC Paianias, ATHENS/GREECE. 2016, "Maison et objet", Parc des Expositions Nord Villepinte, PARIS/FRANCE. 2016, "100% SOLO Hotel Show", MEC Paianias, ATHENS/GREECE. 2017, "Maison et objet", Parc des Expositions Nord Villepinte, PARIS/FRANCE. 2017, "Decorex International", Syon Park, LONDON/UK. 2018, "Horeca", Metropolitan Expo, ATHENS/GREECE. 2018, "Greek Brand New", Athinais, ATHENS/GREECE. 2018, "Nike x NBA All-Star Night", Sponsored the event with our furniture, ATHENS/GREECE. 2018, 2nd Highest, German Design Award, FRANKFURT/GERMANY. 2018, "Jungle", Pantone View Home + Interiors, Page 32, January, NEW YORK/USA. 2017, "Jungle", Andro, http://www.andro.gr/style/ioannis-solomozis/ , July, ATHENS/GREECE. 2017, "Jungle", Popaganda, http://popaganda.gr/ioannis-solomozis/ , October, ATHENS/GREECE. Autodesk 3D Studio Max, Intermediate. 2018, L'Appartment Concept Store Cote D'Ivoire, Furniture & Textiles. 2017, Ippoh Tempura Bar Singapore, Textiles. 2016, Erosantorini, Textiles & Furniture. 2016, Hydrogen Building Nottingham, Textiles Furniture & Lighting. 2017, Christou 1910, Designed the company's products. 2016, Milla Boutique Oslo, Textiles. 2016, Gervasoni SpA, Bath ropes. 2016, Public Headquarters Athens, Furniture. Press Members: Request an exclusive interview with Ioannis Solomozis.